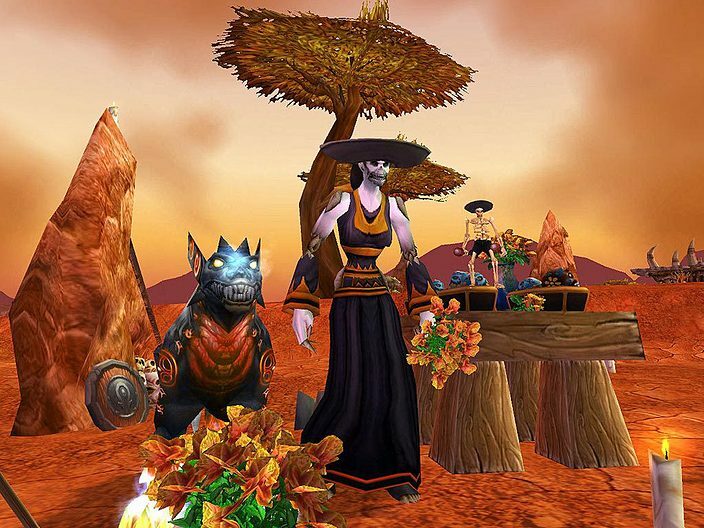 During the Day of the Dead, the people of Azeroth gather in graveyards to celebrate the spirits of those they have lost. The festivities occur in the cemeteries of any major city where celebrants cook, drink, don costumes and more. Let us cherish and honor the ghostly presence of those we have lost, so that they might eat and drink and smile and know that they are loved. Dance with Catrina, and you will be transformed into a skeleton and unlock the [Dead Man's Party] achievement. Purchase some Orange Marigolds from Chapman and use them to see the otherwise invisible spirits waiting in graveyards. Bake (or buy) some Bread of the Dead and give it to a Cheerful Spirit to kick off the Grateful Dead quest and unlock the Macabre Marionette pet. These beautiful flowers are said to attract spirits and help one communicate with the departed on the Day of the Dead. They will also also help you detect invisibility. This delicious bread will help you recover your health and mana, and it can be offered to Cheerful Spirits as a gift. You can wear this grim mask during the Day of the Dead. Your reward for the Grateful Dead quest is a Macabre Marionette, a small pet that looks like a skeleton wearing a sombrero and holding a pair of maracas. This pet can only be used during the Day of the Dead event - it cannot be learned and kept like other non-combat pets. The Day of the Dead currently offers one achievement (Dead Man's Party) that grants 10 achievement points. Check out our Day of the Dead screenshot gallery!